I'm loving sewing for summer. With the amount of rain we've had lately, it's so nice to be looking at bright colours and think about the sun. 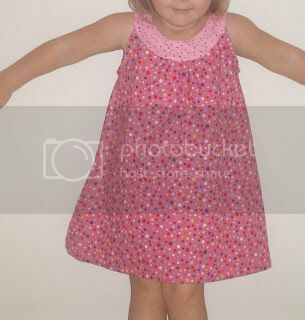 So with that in mind, I've made another dress for Emma. 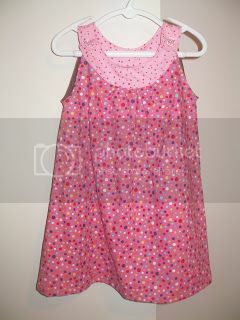 For this one I followed the Prudent Baby Snappy Toddler Top tutorial, and love the outcome. My photos don't really do it justice - I often think of getting a new camera and then decide that I don't want to divert my meager craft funds. So these will have to do. Emma loves it - she's tried it on so many times and we've had many a difficult discussion about taking it off again. It's such a lovely feeling to have someone love what you make them! For a size three I enlarged the pattern by 130%, but if making the size again I'd do 135% just for a bit of extra room. This was the only fiddly bit (I've forgotten how to use a photocopier) but got there in the end! Something for Harry (sort of) is on the sewing table, but I keep getting side tracked. It's a pram liner - I'm scared of sewing the wading so I keep putting it off, but I promise not to start any more new projects until it is finished!